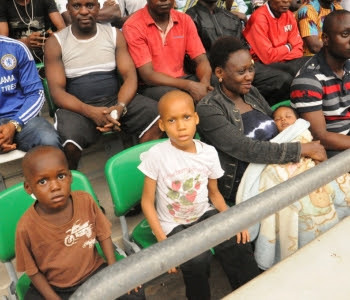 Home / League / NPFL / Are Nigerians losing their humanity because of football? Are Nigerians losing their humanity because of football? The 2015/16 Nigeria Professional Football League season has finally rounded up and what makes the news now must be the reminiscences of the good the bad and ugly of the season. Fans, the media and club players and staff alike should look back at how they handled themselves in during the course of the league and ask tough questions ahead of the next season. The reports from Nigerian stadia this season has been, to say the least very disturbing as fans invaded the pitch a couple of times when decisions did not favour their side and physically assaulted the referees and also disrupted games. We saw it happen in the League and in the Cup games and its frequency no doubt brought the game to disrepute. Now there are two issues here- one of clubs abandoning matches when decisions do not go their way and then fans of an “aggrieved” side invading the pitch while the game is still on to physically assault the match referees. Yes, that is how low Nigerian football has sunk, at least for this out gone football season. Some sections of the Nigerian media would claim stadium violence is not peculiar to Nigerian football and that it is a worldwide occurrence, so maybe, we should go back, down memory lane. That paragraph sums up the emotions of football but looking through a list of notable acts of hooliganism in football stadia worldwide, none quite matches what we have experienced in Nigeria. One of the earliest recorded reports of football violence was in 1885 in a game between Preston North End and Aston Villa. But aside that incident, most, if not all of the cases of football violence had been fan on fan violence before and after games with a few instances right there in the stands. A notable example is the Liverpool vs Juventus in 1985 that led to the death of 39 Juventus fans at the Heysel Stadium in Belgium. However, I have not seen, neither have I heard of incidents in Europe where fans ran onto the pitch to beat the living daylights out of the referees because of a decision that did not go down well with them. Maybe it has happened, but I have not seen nor heard. 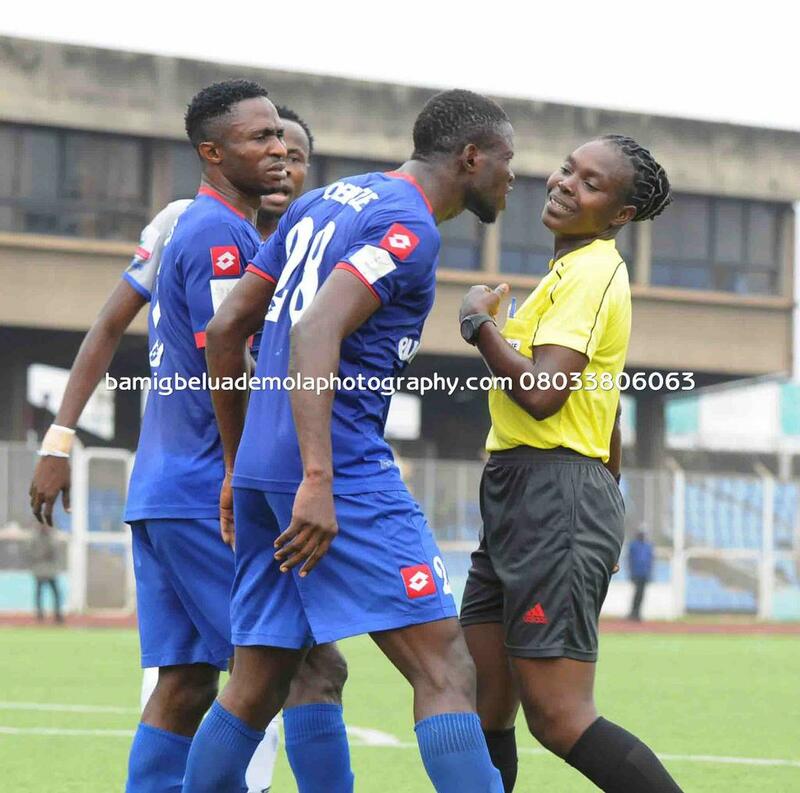 In the Nigerian League and Cup matches, and this is right from the 70s, we have seen fan on fan violence before during and after games but the most disturbing of them is the physical assault on match referees by aggrieved fans that has continued till this day. In the League and Cup this season, there have been cases of clubs refusing to play games the moment they are aggrieved and there is also the case of players and fans physically assaulting the referees, two scenarios that must be condemned. On April 17, 2016, fans of home side, Giwa FC in a game against Enugu Rangers threw objects into the pitch and assaulted the referees in the tunnel. Police had to disperse the fans using tear gas. 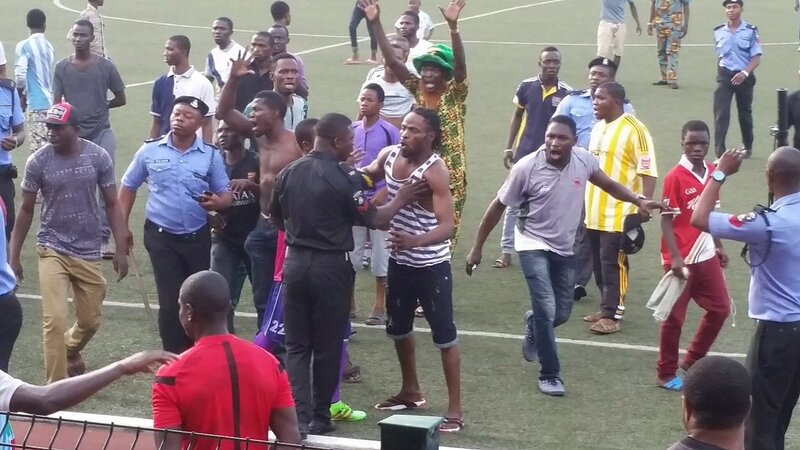 On June 19, fans of MFM FC beat up referee, Alaba Johnson in a game in Lagos against Shooting Stars. On July 10, in a game between Warri Wolves and Wikki Tourists, fans of the home team beat up the referee after the final whistle. 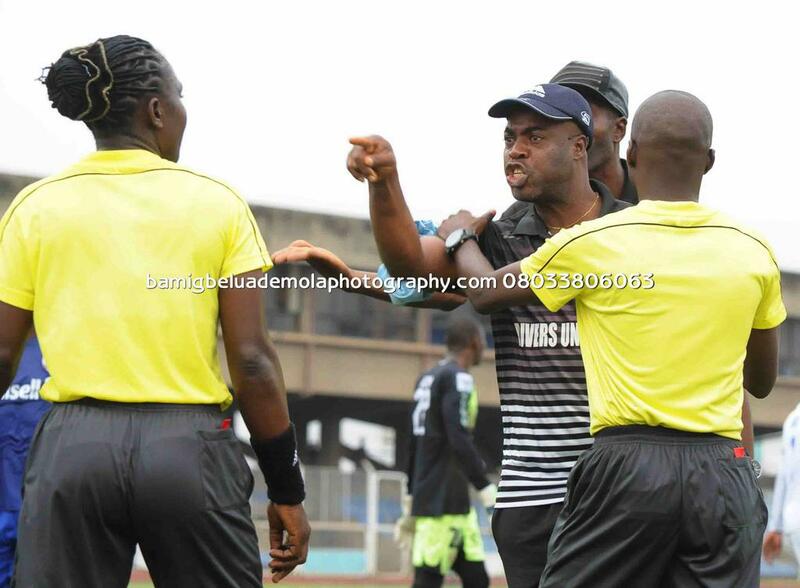 On July 24, in the game between Heartland and FC Ifeanyi Ubah, referees were beaten up at full time. On August 7, Ikorodu United versus Shooting Stars the game was abandoned in the 89th minute after fans unrest when Shooting Stars scored an equalizing goal. On September 7, in Umuahia in a game between Abia Warrriors and FC Ifeanyi Ubah, the referees were beaten up at Full time. The encounter ended 1-1. In the Federation Cup Semifinal game between Warri Wolves and FC Ifeanyi Ubah, the game was abandoned by Wolves as their players chased and assaulted the referee. Also in the Federation Cup semifinal, Rivers United decided to stop playing after Enyimba got a penalty for what would have been their second goal as they already led 1-0 at that point. In the NNL, we have seen it happen in games Go Round FC v Remo Stars, Prime FC v Remo Stars, J Atete v ABS, Crown V J Atete, Delta Force v Remo Stars, Sokoto United v Katsina United. Finally, on Match Day 38, Heartland FC abandoned their game in Jos claiming a penalty call was turned down by the referee and a goal also disallowed. That decision led to their eventual relegation. These are just one too many for one football season, but the one that occurred in the Federation Cup semifinal game in Kaduna between Crown FC and FC Ifeanyi Ubah on Wednesday, September 29, 2016 just further goes to show Nigerians may have lost their humanity over football. The Nigerian media have also played their role in instigating violence, especially those on social media. More often than not, rather than condemn abandoning of games and fans violence, they seem to justify it by blaming referees for poor officiating. There can never be any justification for jungle justice and sections of the media should not make it seem as though the fans had no choice since refereeing decisions seemed not to favour the team they support. If jungle justice is to be condemned on our streets in the case of petty thieves burned or beaten to death, we cannot in another breath justify jungle justice in our football stadia. There also cannot be a justification for bad officiating, but the media should be the enlightened lot, not like a mob with many heads but very few brains. Justifying pitch invasion by the media will not in any way help the development of Nigerian football. The media and all those with access to smart phones and a data plan need to take a deep breath before they hit the key pads next time. FC Ifeanyi Ubah seems to be feeling the brunt of the media anger at poor officiating. The media have made it seem as though it is an FC Ifeanyi Ubah issue, but it is as much an Ifeanyi Ubah issue as it is one of Enyimba, Kano Pillars, Shooting Stars or even Remo Stars in the lower division. The problem with millionaire clubs is that the fans and sections of the media simply turn against you and accuse you of trying to buy the League and it’s the same in Nigeria as it is all over the world. It happened with Iwuanyanwu Nationale between 1988 and 1993. After the disbandment of Abiola Babes and Leventis United and with Chief Emmanuel Iwuanyanwu and his millions buying over Spartans, they signed the key players at these two disbanded clubs and won the League title for three consecutive seasons and also got to the final of the Champions League. A section of Nigerians thought those successes were achieved through untoward means. It also happened with Julius Berger in the 90s when Daniel Idama was club chairman. At that time in Nigerian football, it was rumoured that there were certain referees in the country who received salaries from Julius Berger FC every month. In the last decade, a lot of people also thought Enyimba FC had a lot of referees on their pay roll and they won the league/ games through untoward means. People still say that about Enyimba until this day. 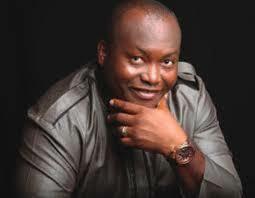 In England, between 2004 and 2012, Chelsea FC were accused of buying success and the same accusation have been thrown at Manchester City, Real Madrid and Paris St. Germain, so the accusations thrown at FC Ifeanyi Ubah are not new. If FC Ifeanyi Ubah are involved in any wrong doing, let the Nigeria Referee Association, NRA handle it because they produce these referees. Then let the Nigeria Football Federation Referee’s appointment Committee take responsibility because they decide which referees handle the matches. Anyone still aggrieved should then make a case with the Nigeria Football Federation proper because they run the game in the country. But to throw decency to the dogs and attempt to murder people in a stadium or demonize clubs and individuals is not on. I have often wondered why Nigerians can go scot free if assault is committed within the walls of a stadium but would be arrested and prosecuted if the same offence is committed on the streets. A mob pummeling a referee is attempted murder, but they mysteriously are allowed to walk, just because it is in a stadium complex, which does not seem right. There should be no amnesty in our stadia, rather situations where arrests are made (not stage-managed ones) and people actually prosecuted for crimes against football. The Nigeria Football Federation should also talk less and show more commitment to stopping the rot. A situation where a referee banned for horrible officiating is alleged to have returned to handle a high profile game is not the best for our football. Nigerians deserve better from the referees and it is the duty of the Referees appointment committee to hand us the best. Weeding the bad seed should be paramount in the plan of the Federation. But as we tackle the problem of questionable officiating, which happens all over the world anyway, the fans need more education. We cannot keep running into a football pitch to lynch people because we are aggrieved. Footballers and club managers also need more education as we cannot walk out of the pitch anytime things do not go our way. Finally, the media, both traditional and new media need to condemn acts that actually bring the game to disrepute. The Nigerian league will get better; it’s a slow but gradual process. We all need to walk together to achieve it. The English did not abandon their game in the dark days of the 70s and 80s, neither did the Spanish or Italians. There is no way we should abandon ours. Have Nigerians lost their humanity because of football? Certainly not! Well a few acted that way, but kudos to Rivers United fans in Port Harcourt as there was no case of fan violence or abandoned games in Port Harcourt all season. 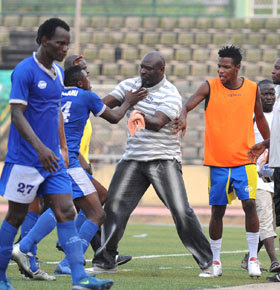 Fans at Elkanemi, Kano Pillars, Wikki Tourists, Rangers at Shooting Stars also behaved themselves this past season as there were no reported cases of violence in the stadia and no games abandoned. Besides, there were more than three hundred games played in the Nigerian league but just less than twenty of them had incidents that would bring the game to disrepute.